Another mug mat - this one is sewn. You need to print this template first. Right click the image and select "Copy image". Open either photo-editing software or PowerPoint. Paste the template into a new document. Drag the corners of the image until it fills a full, regular size piece of paper. Then, print. Let's cut the circles next. Layer your three colors of scraps and your batting. Place the big circle template on top, pin and cut. 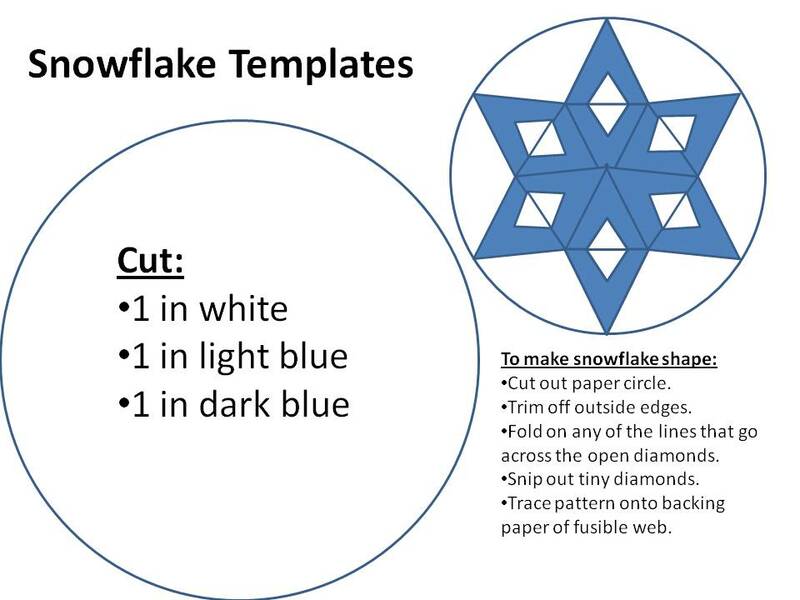 To make the snowflake, cut out the smaller paper circle. Trim off the outside wedges between the points. Fold in half. Try to line up your points before making this fold. Then, fold each of the points in half again on the solid line. Cut out the little diamonds. 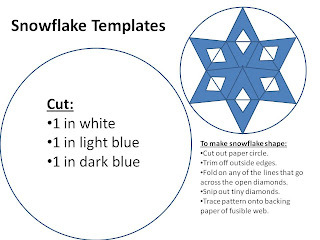 Trace your snowflake onto the paper side of your fusible web. Press it onto the remaining white fabric scrap per package directions. Cut it out. I followed the same steps to cut it out this way as I did for the paper template. Press your new snowflake onto the light blue circle per package directions. Remove paper backing. Layer light blue circle, batting, and white circle. Pin layers together. Using your choice of stitches, sew around outside edges of snowflake. This will not only help secure your applique, but also give the top that quilted look. You can use a straight or zigzag stitch, or a decorative stitch. You can also choose whether to use matching or contrasting thread. Maybe even a metallic thread if you are so inclined. Sew inside the little holes. It may seem a bit tricky at first. I just lifted my presser foot and went to the little space next to the one I just finished. Clip your threads. Then, if desired, quilt between the points of the snowflake. I did. Make your binding from the 2" strip. Use the method we used for the straps for the Little Dresses on Saturday. Layer your mini snowflake quilt with the dark blue circle on the bottom. Carefully pin the binding over all the layers around the edge of the circle, folding under the cut ends a bit to prevent unravelling. Stitch in the center of the strip to secure. Again, straight or other stitch is your choice. I used one on my machine that kind of looks like little snowflakes. Thread color is also your choice. How cute would these be on a Christmas plaid with either green or red binding? How about a metallic snowflake? What if you'd like a snowflake that's a different shape? What about hearts for St. Valentine's Day, or a clover for St. Patrick's Day? Put on your crazy creative hat and have some fun! Simply beautiful! I'd love for you to link up to my new Thematic Thursday meme. The theme this week is Winter and this would be a perfect addition. I'm a new follower now!